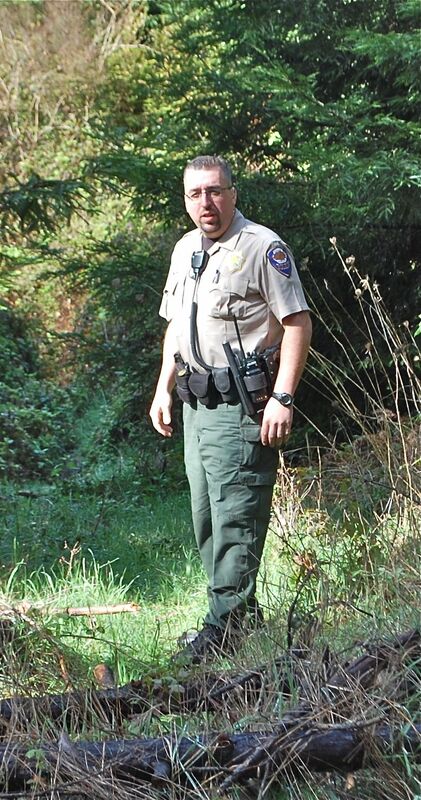 EUREKA – Arcata Police Park Ranger Kevin Stonebarger was injured in a vehicle accident in Eureka Sunday, Sept. 5. Stonebarger was driving home in his APD Ranger truck, a Ford F-150. According to EPD Traffic Officer Tim Jones, Stonebarger was headed south on H Street at 4:20 p.m. when an eastbound 1999 Hyundai Elantra driven by an unidentified adult woman a red light and entered the intersection. “She drove in front of him,” Jones said. Stonebarger’s truck hit the Hyundai broadside, leaving the car “pretty much destroyed,” according to Jones. The woman was hospitalized with serious injuries, reportedly a broken collarbone and broken ribs. Stonebarger was treated and released at St. Joseph Hospital. Jones said there was no indication of drugs or alcohol being involved in the accident. Monday morning, Stonebarger said he was “really sore” from the accident. “My back is the worst,” he said. Following a checkup with his doctor, Stonebarger said he might resume duty this week. Stonebarger is one of Arcata’s two park rangers. He Ranger David Miller are credited with helping reduce abuses of Arcata’s parks and natural areas by illegal campers and others. This entry was posted on Tuesday, September 7th, 2010 at 8:00 am	and is filed under News. You can follow any responses to this entry through the RSS 2.0 feed.